Father Michael's Number Nine Rule for the Interior Life: Don't Be So Impressed with Yourself. Psalm 17: 1, 6-8, 15. The Twenty-Fourth Friday of Ordinary Time. 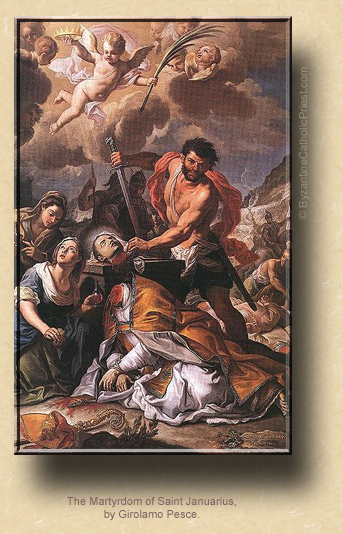 The Memorial of Saint Januarius, Bishop & Martyr. 9:32 AM 9/19/2014 — We have now arrived at the last major section of the Blessed Apostle Paul's First Epistle to the Corinthians. We actually arrived yesterday, but we had no homily yesterday, as you know. If you'll permit me to bore you with a review: the Apostle established the Church in Corinth during his second missionary journey, during his preaching tour through Greece. He had established the Church in Ephesus, leaving his friend Timothy behind as the bishop there, pressing on into Greece alone. He visits a lot of places in Greece: Philippi, Thessalonica, Athens; he basically fails in all of these places except for a few converts here and there, and later writes letters to them which are preserved for us in the New Testament, with the exception of Athens, with his activities there being recorded by St. Luke in the Acts of the Apostles. It's now his third missionary journey, and he's back in Ephesus visiting his friend, Timothy; and, there's a letter waiting for him there from Corinth: things are not as they should be. He's not up for going there himself, and I don't blame him; instead, he writes a letter in reply; all the better for us so we can read it, too. The letter is in four parts: he begins by addressing the divisions that had cropped up among the Christians in Corinth, drawing on his own miserable experience in Athens to teach them some valuable lessons; we spent an entire week discussing that. Then he addresses some of the questions they had sent him, most of which he feels are trivial and beneath him: whether women should have their heads covered in church; whether they're allowed to eat meat bought at the pagan temple's Tricky Tray. He answers their questions, but does so in a rather testy way, pointing out that they've got much bigger problems to worry. They were probably hoping he didn't know anything about them; but, he's the Apostle Paul, and nothing escapes his eagle eye or ear. He lashes out at them about the man in an invalid marriage that the leaders of the Church there had failed to excommunicate because he was a wealthy man and a big donor;—and if that doesn't convince you that there's nothing new under the sun, nothing will—he excoriates them for failing to celebrate the Holy Eucharist in the approved way, laying down a whole host of liturgical regulations which we read about all this past week. Yesterday, today and tomorrow, the Apostolic lessons for Holy Mass are taken from the last—and perhaps most important—part of this letter, for here he dives head first into the problem of heresy. Yesterdays lesson was taken up almost entirely with him establishing his credentials to do this, and he feels compelled to do that because of the controversy which surrounded his claim to apostolic authority. Now, we saw a couple of weeks ago how that was resolved for him by St. Peter at the Council of Jerusalem; but, as we also saw, there were some who weren't happy about the Pope's decision and were still agitating about it; another example of how some things never change. It's interesting how he weaves the flashing of his credentials into the actual question at hand. The issue, of course, centers around what we recognize today as the last article of the Apostles Creed: the Resurrection of the Body; and, he begins his defense of this dogma in yesterday's lesson by appealing to the eye-witness testimony of the Apostles themselves, in which he includes himself even though we know that he was not personally present at the time nor acquainted with our Lord during His time here on earth. Just to review: before Paul came along, the way one identified himself as an Apostle was the fact that he personally knew our Lord. Paul's claim, that his encounter with the Risen Lord on the road to Damascus was equal to the personal association enjoyed by the Twelve, thus qualifying him as an Apostle as well, was hotly contested by many at the Church's headquarters in Jerusalem, and that was the issue that Peter was asked to decide at the Council. Peter, of course, decides in Paul's favor, confirming his status as a real Apostle; and, in a stunning leap of logic worthy of Aristotle, Paul asks the Corinthians in yesterday's lesson: If my encounter with the Risen Lord counts the same as the other Twelve having known him in the flesh before his Passion, then how can you possibly doubt the reality of the Resurrection of the Body? It's actually quite masterful: in one sentence he not only qualifies himself to correct the heresy, but corrects the heresy all at the same time. Today's lesson is nothing more than a common sense continuation of yesterday's in which he points out what to us may seem obvious: the fact that, if there is no such thing as the Resurrection of the Body, then Christ himself is not risen; and, if Christ himself is not risen, then what in the wide world of sports are we doing here? Tomorrow's lesson is the wrap up, in which the Apostle takes us all the way back to the Creation to make his point; and, if I do preach to you tomorrow, it will probably be on the Gospel lesson anyway; and, next week the first lessons for Holy Mass are all from the Book of Proverbs, and God alone knows what we're going to do with those, if anything. So, as we prepare to say goodbye—temporarily, of course—to the Blessed Apostle Paul, I would offer for your reflection today the one question the Apostle doesn't answer in this letter: How could the Corinthians possibly have reached this point? We saw, when we first began this whole saga, what a vital and vibrant Church Paul had left behind in Corinth, how it had grown so quickly and had become the center of the Church in Greece, sending out missionaries of it's own all over the country; and yet, here they are on the verge of abandoning the central mystery of the faith. How could such a thing have happened? And I think the answer might lie in between the lines of the other things the Apostle is compelled to deal with in his letter: the divisions centered around individual Christian leaders who had allowed themselves to develop personal followings; the watering down of the Gospel in order to accommodate some sort of inculturation or social sensitivity; the paralysis of the Church in the face of the moral depravity of some of its members; the failure of the Church to excommunicate the morally depraved because they were influential and had money; the failure to restrain those who exercised liturgical ministries, allowing them to believe that the liturgy was about them and not about Christ. My goodness! Was this letter written in the year 55, or was it written yesterday? If we had to sum up the First Epistle to the Corinthians in one simple sentence, I think it would be this:—and I'm going to leave this with you as Father Michael's Number Nine Rule for the Interior Life—don't be so impressed with yourself.